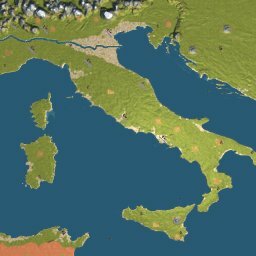 Build Italy into a modern day European nation. In the 1860s, a nationalist movement developed and led to the reunification of Italy — except for Rome. In 1861, Victor Emmanuel || of the House of Savoy was proclaimed King of Italy. Rome was incorporated in 1870. This scenario covers the period of 1870 to 2007. Logical and challenging tasks. Well done. Don’t expect any fast cargo trains until the end of second time period. I’ve finished it on my second try. Lots of fun. Victoryee, I’m guessing this is only your second map. You cannot have more than one map in UserMaps at a time. Make a place to store the ones you downloaded and store the ones you have played in there, deleting them from UserMaps. Then put this map in there and play it. I thoroughly enjoyed playing this map. 1. Is there a small bug thatthe Fish farm of siena could not be connected? 2. And I thought is it too difficult to connecting resources with factories at the 1st Era? I come from china. and I translated it into Chinese Version.I really like this map, it is too much fun in the usermaps. I think you may put more resources in the maps, because it the cross sea bridge is too long and too many that may cause the game crash. Nice map! Like previous was said, that 3st period first task about fast speed from Rome and Naples, only can achieve at end when fast train shows up, at first got headache about that, after I was happy…. 🙂 Got a lot fun, thank you!